Federal Panel Of Judges Dismisses All Ethics Complaints Against Brett Kavanaugh The judges acknowledged that the complaints are "serious" but noted there is no existing authority for lower court judges to hold Supreme Court justices accountable. 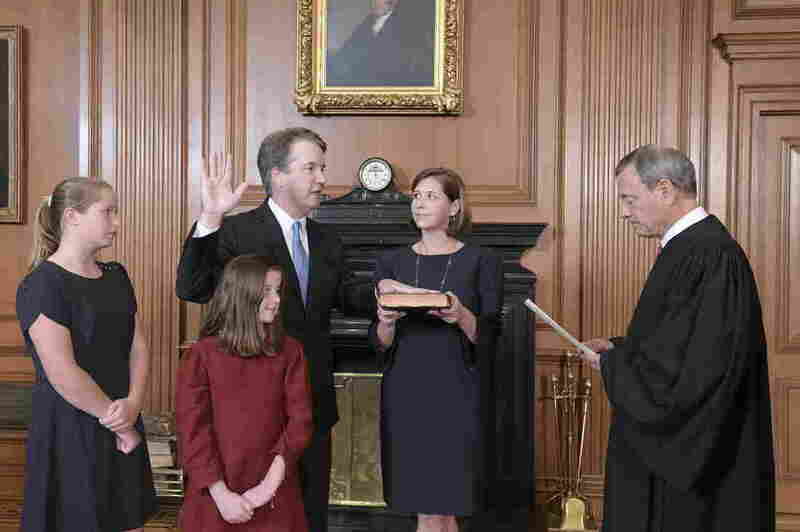 Chief Justice John Roberts administers the constitutional oath to Judge Brett M. Kavanaugh as his wife, Ashley Kavanaugh, holds the Bible. They're accompanied by their daughters, Margaret and Liza. But shortly thereafter, Kavanaugh was confirmed for a lifetime seat on the U.S. Supreme Court. And on Tuesday, Chief Judge Tim Tymkovich, of the 10th Circuit, acknowledged that while the complaints "are serious," the judicial council panel is obligated to dismiss them, because it has no authority over Kavanaugh.